Plot: A gifted high school football player must learn to embrace his talent and his faith as he battles racial tensions on and off the field. Starring: Sean Astin, Nic Bishop, Caleb Castille, Sherri Shepherd. 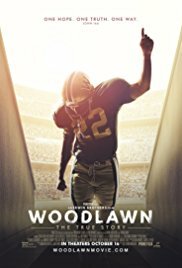 distributed by Pure Flix «Woodlawn» in the US movie theaters released on October 16, 2015 and has grossed over $14 million worldwide; dvd and blu-ray release date was set for January 19, 2016. Netflix dvd by mail rental date set for February 16, 2016. Redbox rental date is not announced. «Woodlawn» in the UK has no theatrical release date. DVD and blu-ray release date is not available at this time.